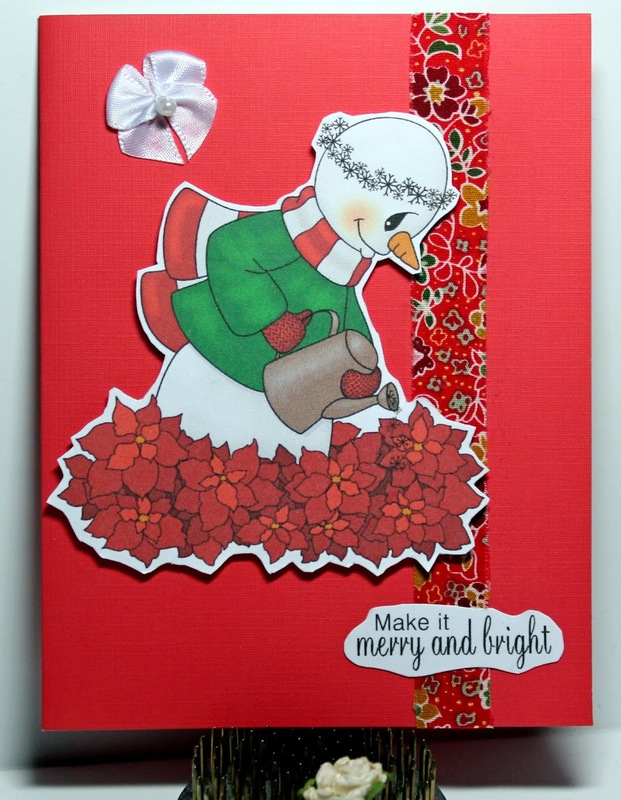 This sweet image of a poinsettia snowman is from Beccy's Place and I use it as a salute to Mom. :-D The image is fussy cut (by hand) and popped up on dimensional tape. The fabric tape was a gift from my friend, Christi, who sent me a whole box of goodies! Thanks, Christi. The sentiment is part of the image set and I hand cut it before adhering it. The little white bow is one of the ones I make by the dozens and toss into my stash for future use. This is so cute, love the wonderful gardener. Have a wonderful Christmas my dear friend. What a beautiful salute to your Mom, NC, thank you for sharing the story. I love poinsettias too, but I very much doubt that I could grow one. And of course, given that I live in Australia they would flower in July and August rather than at Christmastime. Great job on the card! A Beautiful card with lovely memories attached. We have successfully had a poinsettia last through all year, no red leaves though, ah! well we tried LOL. for taking part in Pattie's Creations Design Challenge. So cute christmas card! Thank for playing with us at Di's Digi challenge. A lovely card and a great image. Thank you for sharing at Winter Wonderland. Super cute card,love it and the design too. Thank you for joining us at A GEM OF A CHALLENGE,hope to see you again. Super sweet card. Thank you for joining us for our 'Anything Goes' Challenge #234 at A Gem of a Challenge.